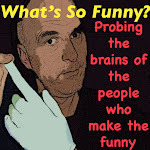 We've got another itinerant episode in the car with an itinerant standup comedian. Marcus Ryan hails from the land down under but spends his time in various countries all over the globe. Every couple of years he finds himself in Vancouver and we always welcome him to the show. In this episode, Marcus explains the terrifying insects and reptiles of his home and native land, talks about his one-man Edmonton Fringe show called Love Me Tinder, complains about the unrelenting heat of Vancouver summers, regales us with a harrowing tale of hitchhiking in Ucluelet, sings the praises of Burning Man, and second-guesses his merchandizing strategy. Crikey, it's a good one! Throw another shrimp on the barby and have a listen. Click below or download us at iTunes, Stitcher or wherever fine podcasts are dispensed. We talk to the great Ron Josol in roving studio in this episode. It's fitting because Josol roves all over the world in pursuit of laughs. We talk about performing in Haiti, the Philippines, China and the US, and how it takes an adaptable nature. We also discuss duck embryos, Russell Peters, and the effect a family tragedy had on his life. Check it out below. Or download us at iTunes, Stitcher, TuneIn Radio, etc. Hell, just go ahead and subscribe already. You know him and love him as Matt Billon. But Matt Bilinski is a new man. After 36 years with one name, he's opted to start fresh with another one, opting for that age-old show biz tradition of longer and more ethnic sounding. Wait... what? But there's reason behind his decision, as you'll hear on this episode. He also tells us how he took down a criminal, how he spurned Hollywood in the early stages of his career, and how he handled a very sick Mike MacDonald (the king of Canadian standup) on the road. It's yours for the taking. Just click below to get started or go download the episode at iTunes or Stitcher or wherever. Tonight we go for a ride with Marcus Ryan. Whenever the Aussie is in town, he joins us on the program. This is his fourth appearance, but first in the Comedy Cab. Marcus is a true itinerant, moving around the world from place to place, hardly spending any time in his home town of Wonthaggi, southeast of Melbourne. I love that name, Wonthaggi, and use it at any opportunity but it doesn't even crack the list of top 10 funny names of places in Victoria, let alone the whole of Australia. Anyway, he'll be putting on his one-man show, Love Me Tinder, at the Edmonton Fringe this summer so look for it if you're around those parts. We're on the air at 11 pm Vancouver time on CFRO 100.5 FM. You can livestream us at coopradio.org. Happy Sunday (cough cough). It's smokey here in Vancouver. Thankfully tonight's episode has been pre-recorded. We'd hate to have to work in these conditions. 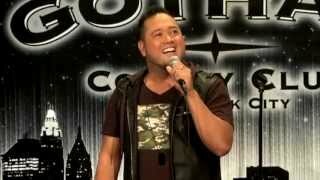 I spoke to standup Ron Josol a week or so ago when he was in town to perform at Laffline's in New West. He joined me in the roving studio, the Comedy Cab (aka my car), to talk about playing in Haiti, eating duck embryos, opening for Russell Peters, and how his mother's ill health affected his life. We're on the air at 11 pm Vancouver time on CFRO, 100.5 FM. You can stream us at coopradio.org or wait for the podcast to drop in a few days.